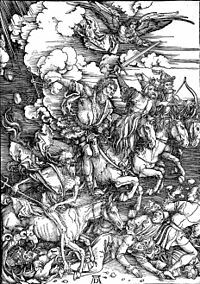 Apocalypticism is the religious belief that there will be an apocalypse, a term which originally referred to a revelation, but now usually refers to the belief that the end of the world is imminent, even within one's own lifetime. This belief is usually accompanied by the idea that civilization will soon come to a tumultuous end due to some sort of catastrophic global event. Apocalypticism is often conjoined with the belief that esoteric knowledge that will likely be revealed in a major confrontation between good and evil forces, destined to change the course of history. Apocalypses can be viewed as good, evil, ambiguous or neutral, depending on the particular religion or belief system promoting them. They can appear as a personal or group tendency, an outlook or a perceptual frame of reference, or merely as expressions in a speaker's rhetorical style. Some scholars believe that Jesus' apocalyptic teachings were the central message Jesus intended to impart, more central even than his messianism. Various Christian eschatological systems have developed, providing different frameworks for understanding the timing and nature of apocalyptic predictions. Some like dispensational premillennialism tend more toward an apocalyptic vision, while others like postmillennialism and amillennialism, while teaching that the end of the world could come at any moment, tend to focus on the present life and contend that one should not attempt to predict when the end should come, though there have been exceptions such as postmillennialist Jonathan Edwards, who estimated that the end times would occur around the year 2000. The gospels portray Jesus as an apocalyptic prophet, described by himself and by others as the Son of Man – translated as the Son of Humanity – and hailing the restoration of Israel. Jesus himself, as the Son of God, a description also used by himself and others for him, was to rule this kingdom as lord of the Twelve Apostles, the judges of the twelve tribes. Albert Schweitzer emphasized that Jesus was an apocalyptic prophet, preparing his fellow Jews for the imminent end of the world. Many historians concur that Jesus was an apocalyptic prophet, most notably Paula Fredriksen, Bart Ehrman, and John P. Meier. E. P. Sanders portrays Jesus as expecting to assume the "viceroy" position in God's kingdom, above the Apostles, who would judge the twelve tribes, but below God. He concludes, however, that Jesus seems to have rejected the title Messiah, and he contends that the evidence is uncertain to whether Jesus meant himself when he referred to the Son of Man coming on the clouds as a divine judge (see also Daniel's Vision of Chapter 7), and further states that biblical references to the Son of Man as a suffering figure are not genuine. There are a few recorded instances of apocalypticism leading up to the year 1000. However they mostly rely on one source, Rodulfus Glaber. Specifically in Western Europe, during the year 1000, Christian philosophers held many debates on when Jesus was actually born and when the apocalypse would actually occur. This caused confusion between the common people on whether or not the apocalypse would occur at a certain time. Because both literate and illiterate people commonly accepted this idea of the apocalypse, they could only accept what they heard from religious leaders on when the disastrous event would occur. Religious leader, Abbo II of Metz believed that Jesus was born 21 years after year 1 which was commonly accepted by close circles of his followers. Abbot Heriger of Lobbes, argued that the birth of Jesus occurred not during the year 1 but rather during the 42nd year of the common era. Eventually many scholars came to accept that the apocalypse would occur sometime between 979-1042. Although there were debates about the apocalypse itself, few people actually understood the consequences of what would happen if the apocalypse occurred. Unfortunately, few documents from around the year 1000 exist to actually interpret what people thought would happen, and because of this, many scholars are unaware of what people actually felt. People do understand that the idea of apocalypticism has influenced several Western Christian European leaders into social reform. With influences by the German ruler Otto III, the Sibyls, and Abbot Adso of Montier-en-Dier, many of the people under these influential figures felt that their rule was a sign of spiritual preparation for the apocalypse itself. It is suggested that because of the influence and reputation of these people, many wanted to follow suit and believe that the apocalypse would occur simply because their leaders felt it to be true. The Fifth Monarchy Men were active from 1649 to 1661 during the Interregnum, following the English Civil Wars of the 17th century. They took their name from a belief in a world-ruling kingdom to be established by a returning Jesus in which prominently figures the year 1666 and its numerical relationship to a passage in the Biblical Book of Revelation indicating the end of earthly rule by carnal human beings. Around 1649, there was great social unrest in England and many people turned to Oliver Cromwell as England's new leader. The Parliamentary victors of the First English Civil War failed to negotiate a constitutional settlement with the defeated King Charles I. Members of Parliament and the Grandees in the New Model Army, when faced with Charles's perceived duplicity, reluctantly tried and executed him. Preacher William Miller, who led his followers to the Great Disappointment of 1844. 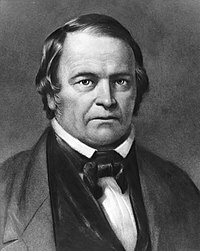 The Millerites were the followers of the teachings of William Miller who, in 1833, first shared publicly his belief in the coming Second Coming of Jesus Christ in roughly the year 1844. The ideological descendants of the Millerites are the Seventh-day Adventists. One notable example was the following of Margaret Rowen, a member of the Los Angeles Seventh-Day Adventists, who believed the second coming of Jesus was to strike on February 6, 1925. Like many 19th-century American Protestant churches, the Mormon tradition teaches that adherents are living shortly before the Second Coming of Christ. The term "latter days" is used in the official names of several Mormon churches, including The Church of Jesus Christ of Latter-day Saints. LDS president Wilford Woodruff preached multiple times that many then-living adherents "would not taste death" before witnessing the return of Christ. The Jehovah's Witnesses denomination has issued several predictions of the end of the world. It presently believes that the world entered the "latter days" in 1914 and that the actual return of Christ is going to take place before the death of some contemporaries of people who were alive in 1914. According to Jainism, time is beginningless and eternal. The Kālacakra, the cosmic wheel of time, rotates ceaselessly. 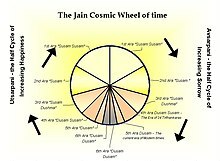 The wheel of time is divided into two half-rotations, Utsarpiṇī or ascending time cycle and Avasarpiṇī, the descending time cycle, occurring continuously after each other. Utsarpiṇī is a period of progressive prosperity and happiness where the time spans and ages are at an increasing scale, while Avsarpiṇī is a period of increasing sorrow and immorality with decline in timespans of the epochs. Each of this half time cycle consisting of innumerable period of time (measured in sagaropama and palyopama years)[note 1] is further sub-divided into six आरा (aras) or epochs of unequal periods. The first four aras constitute millions and billions of years, whereas the last two are of 21000 years each. No divine or supernatural beings are credited or responsible with these spontaneous temporal changes, either in a creative or overseeing role, rather human beings and creatures are born under the impulse of their own karmas. Currently, we are living is in Duḥṣama epoch of avasarpiṇī (descending phase). The Duḥṣama ara, i.e. the fifth ara is said to begin around 2000 years ago. Thus, it will go on for around more 19000 years. And after further 21000 years of Duḥṣama- duḥṣamā ara, i.e. sixth ara, again the avsarpini cycle will be reversed into utsarpini cycle beginning with Suṣama-suṣamā ara, i.e. first ara. Thus, the cycle continues. But, whether there will be an apocalypse while transitioning from sixth ara of avsarpini cycle to the first ara of utsarpini cycle is a matter of debate. Some Jains believe that since in the sixth ara people will be fed up of all the misery, they will turn to living natural life on their own after the completion of the ara. Some believe that, for the contrasting change from a very unhappy time into a very happy time, an apocalypse will occur and there will be complete transformation of the earth and its inhabitants. Some also believe that an apocalypse can occur even during the transition from the fifth (current) epoch into the sixth epoch. Thus, even if an apocalypse is to occur, it will occur after 19000 years or after 40000 years (19000 + 21000). Jewish apocalypticism holds a doctrine that there are two eras of history: the present era, which is a combination of good and evil, and a purely good world to come that will be ruled over by God. At the time of the coming era, there will be a messiah who will deliver the faithful into the new era. Due to incidents arising very early on in Jewish history, predictions about the time of the coming of the Jewish messiah were highly discouraged, lest people lose faith when the predictions did not come true during the lifespan of the believer. Moses of Crete, a rabbi in the 5th century, claimed to be the messiah and promised to lead the people, like the ancient Moses, through a parted sea back to Palestine. His followers left their possessions and waited for the promised day, when, at his command, many cast themselves into the sea, some finding death, others being rescued by sailors. The 2011 end times prediction made by American Christian radio host Harold Camping stated that the Rapture and Judgment Day would take place on May 21, 2011, and that the end of the world would take place five months later on October 21, 2011. UFO religions sometimes feature an anticipated end-time in which extraterrestrial beings will bring about a radical change on Earth or lift the religious believers to a higher plane of existence. One such religious group's failed expectations of such an event served as the basis for the classic social psychology study When Prophecy Fails. Apocalypticism was especially evident with the approach of the millennial year 2000, in which simultaneous computer crashes caused by uncorrected instances of the Y2k bug were expected to throw global commerce and financial systems into chaos. Piggy-backing on these issues, and probably driven by the "interesting date" unsupported allegations of an apocalypse were common. The 2012 doomsday prediction was a contemporary cultural meme proposing that cataclysmic and apocalyptic events would occur on December 21, 2012. This idea has been disseminated by numerous books, Internet sites and by TV documentaries with increasing frequency since the late 1990s. This date is derived from the Mesoamerican Long Count calendar which completes 12 baktuns or 1 Great cycle equaling 5,125 years on December 21 or 23, 2012. There is also a movie called 2012 made in 2009 inspired from this theory. The prediction given by the Mayans about what would happen at the end of this Great Cycle is described as a rebirth of this world and the beginning of an age of enlightenment. There are also other interpretations of assorted legends, scriptures, numerological constructions and prophecies encircling this date. Self-claimed Christian "numerologist" David Meade predicted in 2017 that a hidden planet named Nibiru (sometimes known as Planet X) would collide with Earth on September 23, 2017. His claims received extensive media attention. He calculated his prediction based on numerical bible codes and coded messages in the Giza Pyramids. After his September 23 prediction failed, he revised the apocalypse to October 2017, where he predicted the seven-year tribulation would begin on October 15 as well as other events that month, such as magnitude 9.8 earthquakes, that people would levitate in the air (including Donald Trump and Mike Pence), a nuclear attack by China, Russia, and North Korea on the United States, and that Barack Obama would be president for an illegal third term. October passed without incident. He received criticism over his predictions from Christians and his theories have also been debunked by scientists, including NASA by stating that Nibiru does not exist and a collision with Earth is unlikely. The Brethren (Jim Roberts group), also known as "The Body of Christ". ^ a b c Sanders, E. P. The historical figure of Jesus. Penguin, 1993. Chapter 15, Jesus' view of his role in God's plan. ^ Sanders, E. P. The Historical Figure of Jesus. Penguin, 1993. Chapter 13, The Coming of the Kingdom. ^ a b Underwood, Grant (1999) . The Millenarian World of Early Mormonism. Urbana: University of Illinois Press. See also "Chapter 7: Apocalyptic Adversaries: Mormonism Meets Millerism". pp. 26–36, 49–51, 63–72, 112–126. ISBN 978-0252068263. ^ Staker, Susan, ed. (1993). Waiting for World's End: The Diaries of Wilford Woodruff. Salt Lake City, Utah: Signature Books. ISBN 978-0941214926. ^ "Holy spirit's role in the outworking of Jehovah's purposes". The Watchtower. 15 April 2010. p. 10. Retrieved 22 July 2017. ^ Doniger 1999, p. 551. ^ Dundas 2002, p. 20. ^ von Glasenapp 1999, pp. 271-272. ^ "Jesus Returning to Earth On May 21, 2011". Flashnews.com. 2010-07-30. Retrieved 2010-11-29. ^ "May 21, 2011: Judgment Day believers descend on Joburg". The Daily Maverick. Retrieved 2010-11-29. ^ "Rapture: Harold Camping issues new apocalypse date". BBC News. 24 May 2011. Retrieved September 23, 2011. Brasher, Brenda E. (2000). "From Revelation to The X-Files: An Autopsy of Millennialism in American Popular Culture", Semeia 82:281–295. Stewart, Kathleen and Susan Harding. 1999. "Bad Endings: American Apocalypsis." Annual Review of Anthropology, 28, pp. 285–310.